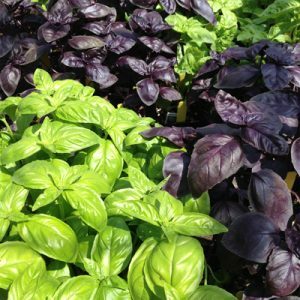 Herbs are easy to grow in window boxes, patio containers and the garden, and make a big impact in cooking. Many herbs are perennial and come back year to year. Others need constant warmth and can be brought in as fragrant, edible houseplants before the first frost. Stock up on kitchen staples like basil, oregano and thyme. Plenty of hard-to-find herbs like feverfew, bay laurel and tarragon. Varieties and availability are subject to change. If you’re looking for perennial herbs like hyssop and lavender, browse our perennials selection. We sell annual herbs in generous 3″ pots and large 4-cell packs. Pricing and sizing by plant varies. Our annual flowers, vegetables and herb plants are grown pesticide-free using Integrated Pest Management in our antique glass greenhouses.